This shield is a 3 channel interface for external encoders . It keeps track of the pulses that are sent from encoders.It offloads all the computation of keeping track of the encoders to the chip. 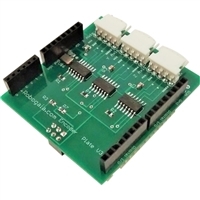 The interface between the shield and the Arduino board is SPI . It includes example code that can read all 3 channels. It is based on the LS7366R chip.